Probably everyone knows the fabulous ice cream brand Ben & Jerry’s – to be fair, before I went vegan I was absolutely in love with their cookie dough ice cream and I am absolutely amazed that huge brands like B&J are making steps into the right direction and created vegan ice creams that were published in Australia earlier this year. In the UK we are – unfortunately – still waiting for the release for their vegan creations and no date has been confirmed yet (at least not that I know of). 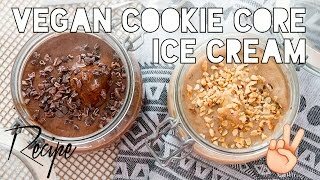 “But why wait” I thought and wanted to try and make my own cookie dough ice cream… AND HERE IS THE RESULT! Perfect refreshment for summer and I have to admit: It wasn’t difficult at all to make these! Previous Post DIY: Vegan Bacon!